Behavioral Problems: Children of depressed mothers are more likely to develop behavioral problems down the line, including sleep problems, temper tantrums, aggression, and hyperactivity. Delays in Cognitive Development: Development is often delayed in babies and children who have depressed mothers. They may learn to walk and talk later than other children. They may also have other learning difficulties. Social Problems: Children of depressed mothers have difficulty establishing secure relationships. They may find it hard to make friends in school. They may be socially withdrawn, or they may act out in destructive ways. Emotional Problems: Studies show that children of depressed mothers have lower self-esteem, are more anxious and fearful, passive, and less independent. 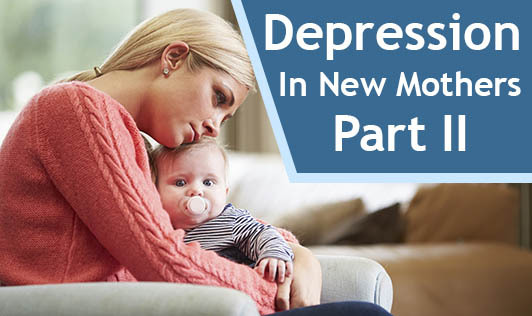 Depression: The risk of developing depression early in life is particularly high in children whose mothers suffered postpartum depression. Find people who can help you with child care, housework, and errands so you can get the much needed rest. Make time for yourself every day, even if it's only for 15 minutes. Do something relaxing or that makes you feel good about yourself. Give yourself credit for the things you're able to accomplish, even if you only get one thing done in a day. If you aren't able to get anything done, don't be hard on yourself. Remember that no one expects you to be a super-mum. Be honest about how much you can do. Take help of family and friends. Do not hesitate to take professional help if needed.